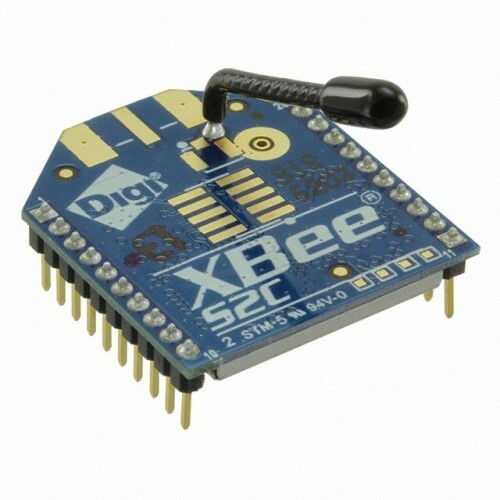 The XBee 3mW Wire Antenna is the XBee XB24CZ7WIT-004 module from Digi with inbuilt Wire antenna. Series 2C improves on the power output and range over standard Series 2 modules. Series 2C modules allow you to create complex mesh networks based on the XBee ZB ZigBee mesh firmware. These modules allow a very reliable and simple communication between microcontrollers, computers, systems, really anything with a serial port! Point to point and multi-point networks are supported. The XBee 3mW Wire Antenna - Series 2C module has essentially the same hardware as the older Series 2, but has updated firmware and higher power output. Note: If you are looking for a simple point-to-point configuration, you might want to try the Series 1 instead. Note: Series 1 and Series 2C XBee modules have the same pin-out. However, Series 1 modules cannot communicate with Series 2C modules.